Fall is here guys – Damn, I Can Make That! Vegetarianism usually makes my skin crawl…usually. I don’t feel full or complete unless there is some sort of protein with my dinner. Alas this blog has proven me wrong yet again. I always knew mushrooms were a good meat substitute because of their heartiness, but never truly was convinced. Makes no sense why I didn’t agree, they are earthy and filling. However, this dish is the first time in which I was sold on how I can eat a meal and not miss the protein. Especially because I love poblano peppers. So to test this puppy out was no hard sell. (Side note to my adoration of poblano sauce: One of my old co-worker’s grandmother would make poblano mac & cheese. It was her comfort food, a Guatemalan twist on an American classic. Ever since her sweet granny fed us all one day at work, its been my fav pepper to use). Speaking of comfort foods, polenta is the ultimate Italian comfort food so this meal will just make you feel all kinds of love. (Even if you don’t have a warm & fuzzy about poblano sauce like I do).For those of you unfamiliar with polenta, its a mashed potato-y consistency, but made with cornmeal so its healthier for you. I will say that the original recipe calls for one to make their own polenta and I will be damned if I don’t find a short cut. Shock, my good old favorite Trader Joe’s has a pre-made organic polenta they sell for a whopping $1.99 and its just so yum and low calorie! Oh, don’t worry my recipe trashes it up pretty well so that it doesn’t stay low cal for long. Guys, comfort food wouldn’t be so yummy without some butter and love. The nights are getting cooler and its time to grab your favorite hoodie and bowl of this and eat on your deck, patio, porch, backyard…you won’t be disappointed. Plus after a summer of burgers & dogs, you won’t even miss the meat! Cut up the polenta and microwave on high at 2-3 minutes with the butter. Just to soften and mix. Then you can, roast the poblano peppers over an open flame or in the oven until the outside is slightly charred. Cut into pieces and set aside. Puree the sour cream, water, oil, garlic, and salt in a food processor. Add the green onions and poblano peppers and puree until desired consistency is reached. I like to leave a little bit of texture in the sauce. In a separate pan, melt 1 tablespoon butter over high heat. Add the garlic and the mushrooms; saute until golden brown. Add the sauce and the cornstarch dissolved in water. Bring to a simmer until the sauce is slightly thickened. 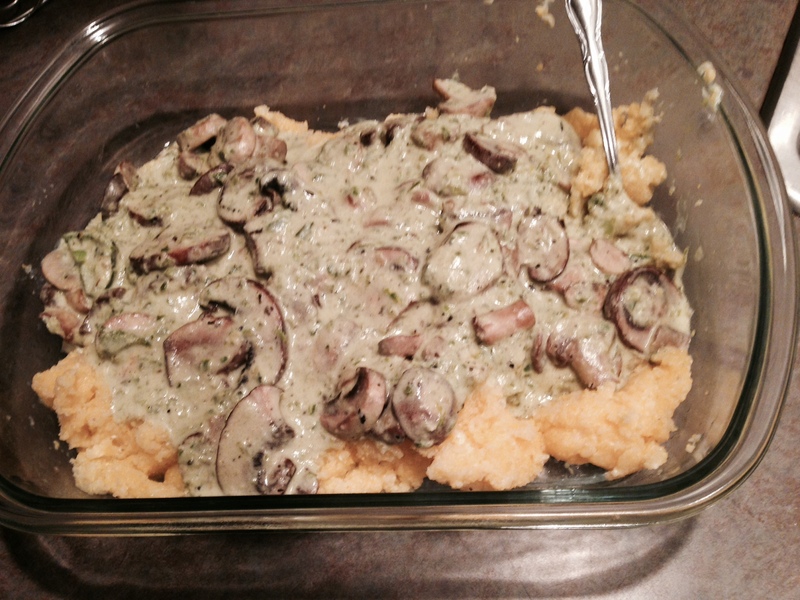 Serve the mushrooms and sauce over the polenta. YUM-O!! This entry was posted in Damn Good Dinners and tagged Butter, cornstarch, garlic, green onions, mushrooms, poblano, polenta, sauce, sour cream. Bookmark the permalink. Pingback: Firehouse Chili | Damn, I Can Make That! Hello! Someone in my Facebook group shared this website with us so I came to check it out. I’m definitely loving the information. I’m book-marking and will be tweeting this to my followers! Outstanding blog and amazing design. Yes! You can follow us @damn_delish.